Benedetto Manasseri, an Italian of African descent, was born near Messina, Italy to Cristoforo and Diana Manasseri in 1526. His parents, captured as slaves from Africa in the early 16th century, were brought to San Fratello, near Messina. They converted to Catholicism and, due to their loyalty to the Church, obtained their son Benedict’s freedom at birth. Benedict did not attend school because his family was impoverished. When Benedict worked as a shepherd in his youth, he would give any extra money he could to the poor. At age twenty-one Benedict was befriended by a nobleman, Jerome Lanze, who encouraged the youth to join a society of hermits under the teachings of St. Francis of Assisi. Upon becoming a member of this enclave Benedict gave the few possessions he had accumulated to the poor. Eventually he became one of Lanze’s principal advisors and, when he was about twenty-eight years old, Benedict succeeded Lanze as superior of the Franciscan-affiliated group of hermits. During the third Council of Trent in 1564 Pope Pius IV decided to disband the hermit societies, whereupon he encouraged their communities to join the Franciscan orders. When Benedict became a member of the Order of Friars Minor he was sent to Palermo, to the Franciscan Friary of St. Mary of Jesus. Benedict rose through the Order, first starting as a cook and advancing to Master of Novices, and eventually to Guardian of the Community. While he remained illiterate throughout his life and was never ordained a priest, Benedict as a lay brother continued drawing people to hear his teachings of the Scriptures and to experience his professed healing abilities. After years of service elsewhere in the Friary, Benedict returned to the kitchens because he enjoyed cooking. Benedict was known for his resourcefulness in feeding more people despite a limited amount of available food. Having suffered persecution throughout his life due to being “il Moro,” or dark skinned, Benedict is remembered for his racial tolerance. Benedict died at the age of sixty-five on April 4, 1589 near Palermo, Sicily, where he was buried in a large tomb in the Friary church. Soon after his death, Benedict became the patron of Palermo. In 1592 Benedict’s body was exhumed, allegedly without signs of decay. In 1611 King Phillip III of Spain added a shrine for Benedict near the Santa Maria de Gesu in Palermo, Italy, at which time Benedict’s body was again exhumed and to be placed in the shrine. In 1743 Benedict was beatified by Pope Benedict XIV, and in 1807 he was canonized by Pope Pius VII. While his exemplary life yielded enough cause for his sainthood, he also came to illustrate the inhumanity of the slave trade. Benedict’s feast day is celebrated on April 4th. 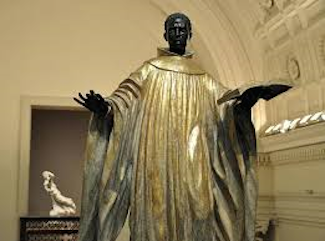 Since Benedict has become the patron saint of Black Catholics in America, there are several churches bearing his name in Washington DC, Savannah and Columbus, Georgia, New York, New York, St. Augustine, Florida, Pittsburgh, Pennsylvania, Omaha, Nebraska, Winston-Salem, North Carolina, and Milwaukee, Wisconsin. Two churches in Chicago, Illinois, St. Benedict the African East, and St. Benedict West, also carry his name. http://www.catholic.org/saints/saint.php?saint_id=871; http://www.roman-catholic-saints.com/st-benedict-the-moor.html; Cyprian Davis, The History of Black Catholics in the United States. (New York: Crossroad, 1990).